When news broke that there was a Grey’s Anatomy spinoff coming to ABC, longtime fans of the medical drama were super excited. 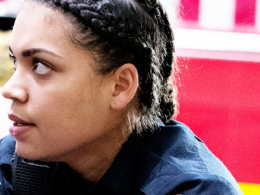 Station 19, which will focus on firefighters operating, at least at first, in tandem with Grey Sloan Memorial Hospital doctors, is the latest Shonda Rhimes project to pique the interest of TV fans. But this new show is built to stand on its own, so even if you haven’t seen Grey’s Anatomy, you can watch Station 19 — at least according to one of the show’s stars, Barrett Doss. 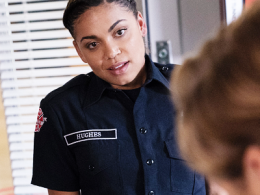 In any case, it seems like Station 19 is going to follow suit along with the rest of Rhimes’ projects in terms of compelling and nuanced characters. The showrunner and her writing teams particularly excel when showcasing women onscreen, something Doss says she’s excited to be a part of. “We’re all just hoping to live up to Shonda’s example,” she says. If Shondaland productions have taught us anything over the years, it’s that fans should prepare to become seriously invested in their characters, and gear up for plenty of dramatic hits to be lobbed their way. 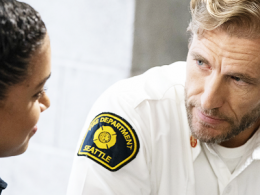 Station 19 seems like it’ll follow in its predecessors’ footsteps in that way, and Grey’s fans can be on the lookout for nods to Grey Sloan along the way. But, at the end of the day, Station 19 is, in the words of David S. Pumpkins, its own thing.